There’s nothing better than enjoying quality coffee at home. The problem is that it’s hard to find the right espresso machine when there are so many options available. 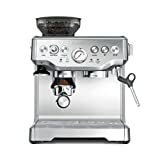 That’s why we’ve put together a list of the Top 10 Best Espresso Machines under $1000 in 2019 – you can take a look and choose the one that best suits your coffee preferences, kitchen, style, and budget. There are plenty of espresso machines out there, from manual versions that give you total control over every step of the process through to super automatic machines that will produce coffee at the touch of a button. Let us help you figure out which is best for you. A good cup of coffee is the best start to the day – it’s why so many people are choosing to buy espresso machines for their homes. The problem is that there isn’t a single ‘best’ espresso machine on the market – what suits one person might not suit another. Some people prefer to grind their coffee separately, others want a machine that does more than just shots of espresso, others want to have coffee at the touch of a button… there are so many differences and options, which is what makes choosing the right machine so difficult. Our top 10 list looks at a range of machines, from manual to super-automatic, from high-end luxury to affordable quality. This will help you find the right espresso machine whatever your budget and preferences. If you’re not sure exactly what you’re looking for, we recommend that you read the Espresso Machine Buying Guide below before committing. This table will show you our top 10 best espresso machines 2019. Every single machine is chosen by our specialist reviewers so you know its strengths, weaknesses, and features before you buy. This machine means business – the stainless steel means it looks like a machine you’d find in a coffee shop, and the bean hopper, burr grinder, and pressure gauge actually give you the functionality to match. The pressure gauge is especially important and one of the things that pushed this espresso machine onto the list. The right pressure is essential to making a good espresso – you need a combination of the right temperature and pressure to make sure that you’re extracting as much flavor as possible from your coffee beans. The gauge is a feature that’s missing on a lot of domestic machines, which can mean that you never know how your machine is performing or why your coffee might not taste quite right – too sour if there isn’t enough pressure or too bitter if there’s too much. As well as letting you know how the machine is performing from cup to cup, it gives you a huge amount of control over your coffee. You can choose from 18 settings on the grind size selector (coarse, fine, and yes – everything in between), decide on filter size, and choose between single or double espresso shots. The manual is clear enough to help you navigate through all of the different options. The resulting coffee is delicious, with golden tan crema and plenty of texture. Perfect for someone who wants to actively participate in the process and create their perfect cup of coffee. 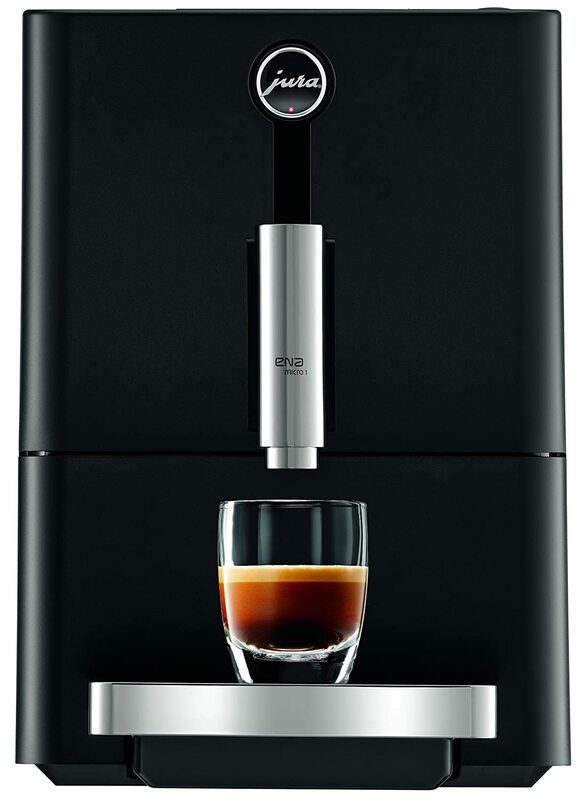 The fact that the machine gives you so much control throughout the process means that you can make exceptional coffee again and again – even better than some of the more expensive (automated) models such as the Philips Saeco GranBaristo Avanti. If you’re in the mood for an Americano or Cappuccino, you’ll find that the hot water nozzle and steamer are extremely reliable and easy to use too. However, that does depend on the skill of the user. If you do not read the manual, or you just tamp the coffee down too hard, you will affect your coffee and probably get pretty frustrated in the process. Once you’ve drunk your coffee, you’ll need to clean your machine – luckily, the grinder is very easy to clean – overall, machine makes less of a mess than others with the same adjustments and spec. It even has a ‘clean me’ light to remind (or nag) you. You can just throw the used coffee in the trash/compost and it has an automated cleaning cycle for the insides of the grouphead as well as tools to clean out the filters. The entire machine is clearly well thought out for every aspect of making coffee, not just the final drink. However, it does make some mess – if you want a totally pristine kitchen you will need to go for a more automated option like the Krups EA 9010. The build quality is good where it counts – the steaming wand is on a ball joint so you don’t need to worry too much about the wear and tear on it, but some people comment that they would prefer a stainless steel top instead of plastic, which can seem a bit cheap considering the price. All in all though, this machine can produce an excellent espresso – if you use it properly. If you want good coffee at the press of a button without sacrificing a lot of counter space, this machine is definitely a contender. Choosing a super automatic machine means that you have slightly less input into your coffee (which may or may not be a good thing) but it also means that you have a more consistent result since the machine makes many of the decisions on your behalf and simply follows its programing. The control panel is extremely easy to operate and allows you to choose from different strengths and coffee sizes, as well as coffees. The milk frother will steam your milk for lattes and cappuccinos, while the grinder can be adjusted depending on how fine you like your grains. However, you do need to select your preferences with every single cup, rather than putting the information in once and making multiple cups of coffee with the same strength/size/type. The only major issue with this machine is the hopper – the angle is quite shallow which can mean that oilier coffee beans tend to get stuck on their way down which can be quite frustrating when you expect everything at the touch of a button. A more minor disadvantage is the size of the water tank – one of the smallest in this list at 1.8 litres, but if you want a compact machine this is one of the compromises that you have to make. The instant reheat option is a nice addition for families of coffee lovers or dinner parties where you would like to make several cups one after the other. The simple design and excellent build quality mean that you should be happily using this model for years to come. As a fully automated machine at under $1000, it doesn’t offer absolute luxury but every function is well done and the machine itself is well designed. Finally, once you have used the machine it is still easy to clean. The self-cleaning mechanism typically manages most of the mess, and the frother, catch pan, and grounds pan are all easier to clean than on similar models. 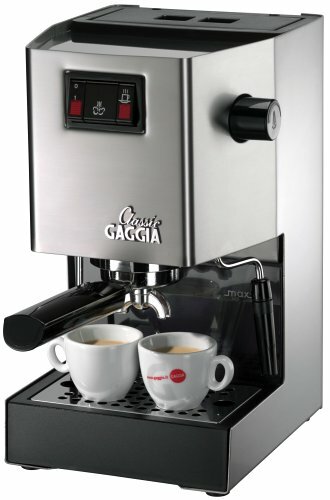 The Gaggia Classic probably looks familiar- it’s in the name. The classic design is incredibly simple and a little retro. Despite the price, it feels well-built and uses steel throughout the machine where other brands have opted for plastic panels. Die-hard espresso drinkers will probably love the simplicity and – yes- inflexibility of this machine. If you would like to make a latte, an Americano, or anything that isn’t an espresso, in an espresso cup, this isn’t the machine for you. If, however, you would like a great-looking gadget that delivers quality espressos every morning without having to click numerous buttons or input detailed preference, this is the one for you. It has a surprisingly generous water reservoir, so you won’t need to refill very often (especially given the limited cup options). This is one of the less expensive machines on the list, so while you need to align expectations with the price the designers clearly spent the money where it counts – on details like the size of the cup holder, the internal design, and consistency. There are, of course, compromises too. The machine is a little slower than its more expensive counterparts. You may also like to change the tamper that comes with the machine to metal, but this is a really easy upgrade. Gaggia are known for their dedication to good coffee and build quality – it would not be at all surprising for this espresso machine to last a decade, particularly since the Classic is seen as one of their best designs. The heating elements are less likely to corrode because they are in the sides of the boiler rather than coming into direct contact with the water. This set up also means that it heats up faster than many other machines. Gaggia machines also go through rigorous testing so the quality and consistency of their machines is far higher than brands in a similar or even higher price bracket. The Gaggia Classic has no bells and absolutely no whistles. It will deliver your morning espresso for years to come – nothing more, nothing less. This is undoubtedly a good looking machine. 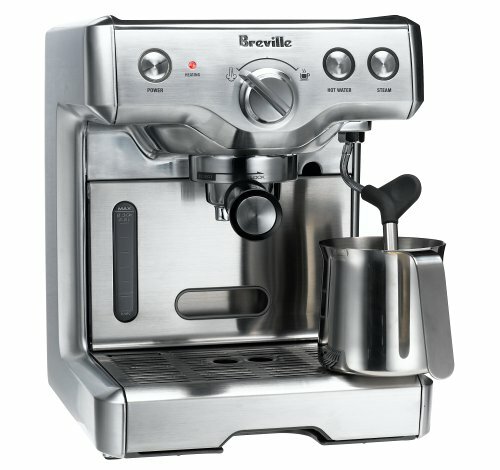 Breville’s espresso machines are typically well-designed and look great on your counter top. But ultimately, the proof is in the coffee, where this machine shines too. There aren’t too many dials or buttons on this machine, but it does offer you control over how long it takes to pull an espresso – for some, that gives them the option of creating the perfect coffee, but others don’t want to have to learn the art behind coffee just to have a good espresso in the morning. Whether you love or hate this machine really depends on your preferences and how much control you want over the process. Generally, it provides a good middle-ground between controlling every single aspect of your drink and just pressing a button and having an espresso shortly afterwards. 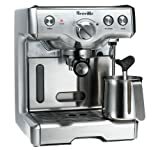 If you have trouble controlling your ratios, there is a hidden benefit to the Breville 800ESXL – it pumps three bursts of hot water into the grounds to moisten them and begin brewing. It also means that you get even more of a delicious aroma both before your coffee is ready and emanating from your drink. One of the best parts of this machine is the timer. You can make sure that your coffee is ready once you’re out of the shower or while you’re doing other things. There are also other fantastic additions such as the top surface heating as long as the power is on to ensure that your cup is ready for the hot espresso. Accent lighting highlights the best features and the steel has a good amount of heft to it for both build quality and appearance. There are, of course, some quirks to the machine. The water tank is the part with the most issues – you can’t top up the water once you start brewing and the machine will often try to keep making coffee if the water tank is empty, which means that you need to turn it off completely and refill. Many machines have a sensor to avoid that but this one seems to be missing that feature. All in all, the machine will deliver good, consistent espressos and will even do them on a timer. If you’re a beginner to coffee or prefer an analogue approach without having to study for your drink like it’s a final exam, this is a great alternative to the more expensive Breville Barista Express. You don’t actually have to choose between coffee at the touch of a button and having your specific tastes catered to in every single way. 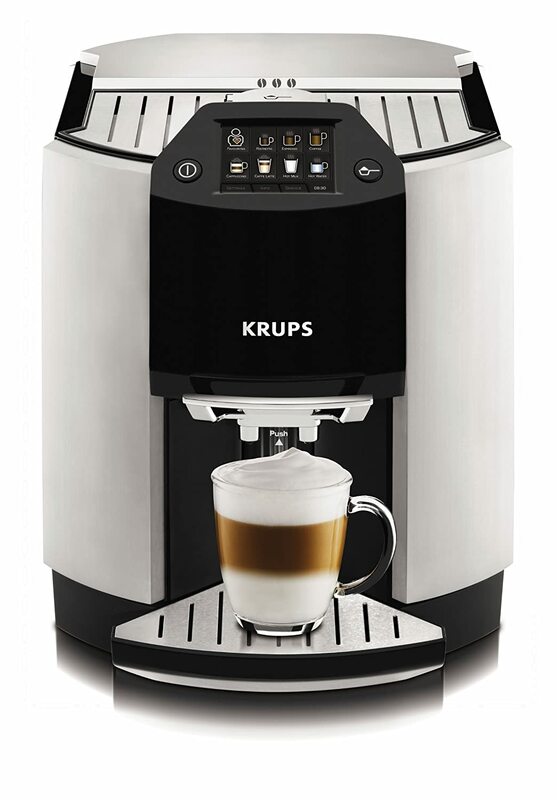 The Krups EA 9010 offers both – you can program your machine to create your perfect cup of coffee down to the grind fineness and amount, temperature, amount of water, and strength, and then have that coffee made for you again and again at the touch of a button. If you can’t be bothered with all that programing (or you’re just not that particular) you can choose from 17 pre-programed recipes instead. Actually, this machine is designed to make every element of your coffee-related life easier. The steamer cleans itself after every use so you can reduce your cleaning too. The manufacturer claims that you’ll never have to open up the machine to clean it, which is a bit of an exaggeration. You will need to empty the drip trays and occasionally clean the insides too. However, pucks are stored in the side so that you can easily empty used grounds from the machine and it even comes with storage for Krups’ special cleaning liquid. The machine comes with two bottles. The design is minimal and doesn’t have a lot of the hands-on, steel-cast charm of some other machines. But that’s because this machine is largely for people who don’t want to deal with the ins-and-outs of coffee making, they just want the results. While a lot of other machines want you to grind, fill, load, and tamp your coffee before you can even pul a shot of espresso, all the Krups EA 9010 wants you to do is ask for it and it’s ready less than a minute later. Even if you want something more involved like a cappuccino, all you need to do is put some milk in a cup and the machine will heat and froth it before pouring the coffee and cleaning its nozzle. The results across all coffee types are delicious, flavorful, and well-balanced. The main downside for this machine is the price. If you want that much done for you and want delicious coffee at the end of it, you do need to pay. That said, the quality and ease of use definitely make it worth the money. 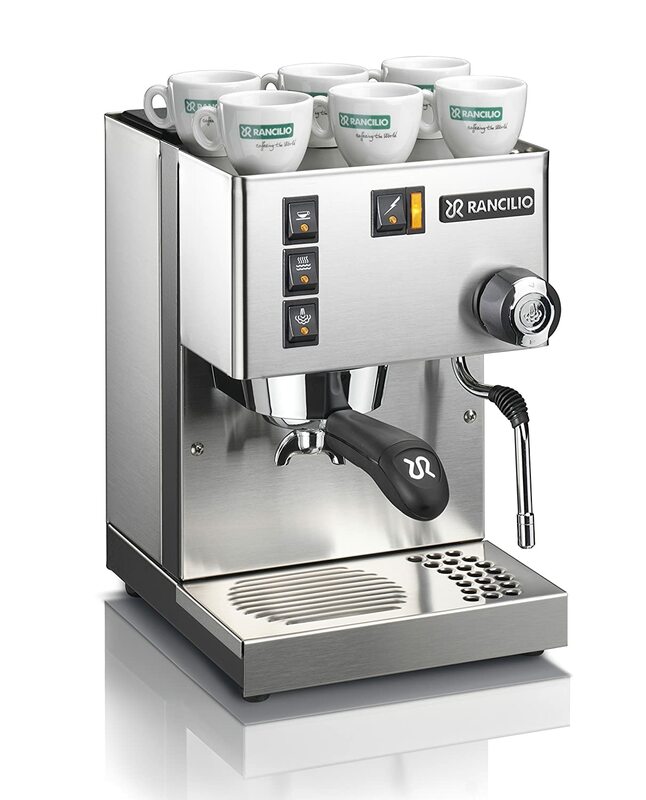 Part of getting good value is making sure that each purchase lasts, and the Rancilio Silvia will definitely do that. This espresso machine is made from steel and iron – while many others look like they’re up to the standards of a discerning barista, they won’t necessarily live long when they have to make multiple cups every single day. That’s where the Rancilio Silvia shines. The machine has commercial-grade technology, including the group head, steamer wand, and porta-filter, so you can benefit from commercial technology that is usually only available in machines that are over $1,000. Its recovery time is in line with commercial machines too, so you can make cups of coffee one after the other without worrying about the steamer or quality. However, the machine does have some temperature issues, particularly with the first shot it pours. You can easily overcome them by ‘temperature surfing’ or buying a kit to convert to digital control, but some people may not want to buy a machine that needs hacks or updates when temperature is so vital to good coffee. Temperature surfing involves running water through the machine until the light comes on – at that point you can fill the water back up and the first shot won’t be luke warm. It means that you don’t need to rewire the machine, but it can be a bit too much work considering the price you pay for it. The simplicity of this machine is a double-edged sword – it’s very easy to operate with few controls, but that does mean that there are no programing options available if you want to be specific about your coffee. Even the website’s suggestions to make sure that your espresso doesn’t flow out too quickly or too slowly mainly involved your tamping rather than making any changes to the settings. That said, many people enjoy the simplicity of this machine and overlook the quirks to enjoy consistent, quality coffee from this machine for decades. If you’re a minimalist and don’t necessarily like your coffee extremely hot, this may be the machine for you. Making good coffee is a surprisingly complex process, which is why most good coffee machines are upwards of $500. If those prices aren’t quite within reach there are still options, but as with everything there are compromises to be made. The Mr Coffee Café Barista is a good machine for people on a budget – the results are tasty and the machine is easy to use. At under $200, that’s a great result and will definitely save you money if you’re used to daily coffee shops. That said, the machine has some features that even the more high-end machines don’t, such as a separate, removable milk reservoir that you can keep in the fridge to avoid clumsy morning spillages. 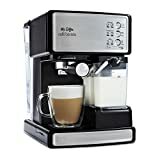 The options are also more varied than some of the espresso-only options here, and allow you to make espressos, cappuccinos, and lattes quickly and easily (including automatic milk frothing). The main drawback of this machine is the inconsistency. Espressos are varied and can go from being rich and intense, through to quite bitter or weak depending on the day/time/how many shots you’ve already pulled. This is largely down to inconsistent temperatures and pressures, which are in turn due to lower-cost materials being used throughout the machine. That said, it is still a good machine for its price. If you prefer your coffee with steamed milk and or just have a smaller budget and no desire to get your hands dirty while making your morning coffee, you should definitely consider the Mr Coffee Café Barista as an option. The Jura Ena Micro 1 is sleek, modern, and offers a few coffee options but does each one well. It’s a super-automatic machine with a one press system, so you can get delicious espresso with minimal input needed. It will use beans or grinds, depending on your preference, and the warranty is a generous 2 years, which is double what many manufactures offer. 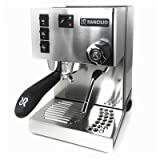 However, this is very much a machine for people who like their espressos and Americanos – if you like a cappuccino or latte, you may want to look at alternatives. This is one of the few machines on this list that does not include a milk frother at all, which can be a major drawback for people who want more than just black coffee. Due to the milk issue, programing options are actually quite minimal. Unlike Krug’s 17 preprogramed drinks, the Jura Ena Micro 1 offers 3 size options, 5 grind options, and 2 strength options. 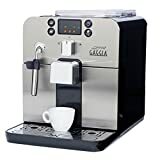 This machine is purely for people who want super-automation without dozens of options to choose from, so this offers a great alternative to espresso-only machines that require more input and super-automatic machines that make every imaginable drink rather than just the espresso you want. It’s a small machine that won’t take up much space on your counter top, but don’t let the size fool you – it’s extremely well built and solid. Perfect for people who want a discreet machine rather than a centrepiece for the kitchen. Despite the cost, it’s actually a fairly economical machine – it has energy-saving settings and works out cheaper than pod machines with less of an environmental impact too. The coffee itself is excellent. Specialising in a smaller number of drinks means that every one is consistently made to a very high standard. Finally, the cleaning options make it easy to maintain – the rinsing cycles are quite aggressive so keep it in good shape and the touch screen will prompt you to carry out any further maintenance when necessary. The longer warranty shows that Jura are confident that this machine will last, and once you want to upgrade you can always trade it in. All in all, this is a machine made for coffee lovers who don’t want the bells and whistles – just good coffee with no messing around. It looks good, won’t use up too much energy, and will last longer than any other coffee machines in the same price range. 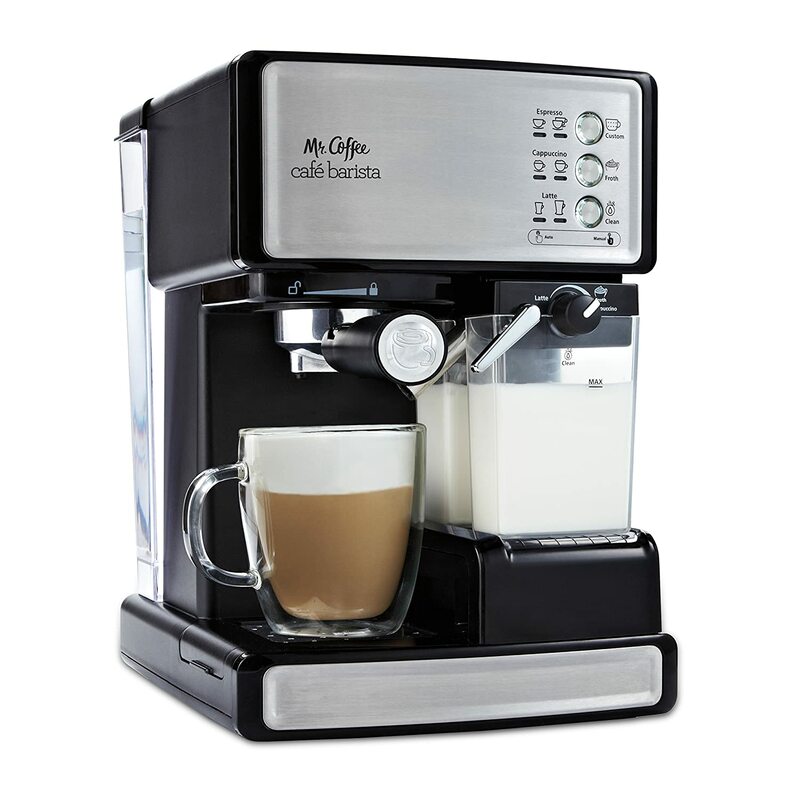 The Gaggia Brera is one of the smallest espresso machines on this list with a built-in grinder. It will fit on even the smallest counter tops to offer aromatic coffee and simple maintenance without totally breaking the bank. Settings are minimal, but offer enough variety to get the right grind, strength, and drink type to suit most coffee lovers and dinner parties. For a lot of coffee lovers, choosing a machine is a combination of finding the right type (manual through to super-automatic), deciding on a built in grinder, and finding something that fits their budget. The Gaggia Brera is firmly mid-market both in price and build quality. Some elements, like the frothing wand, are quite flimsy and parts of the machine are made from plastic. However, it does make a fine espresso and concentrates on ensuring quality and consistency. The Brera is easy to operate and easy to clean up. The simple display lets you choose from 3 espresso strengths and notifies you when the machine needs to be cleaned or maintained. One of the more unusual features is the 4-stage filtration system which ensures good coffee even in areas with poorer water quality – it also means that your machine needs less descaling throughout its life. This is a quality machine at a low cost, provided that you are happy with fewer programs and some plastic components. When you’re buying an espresso machine, knowing what you want is just as important as knowing about build quality and ease of maintenance. This guide will help you decide what you want out of your coffee machine by asking a few questions about your habits and preferences, and will then explain what to look out for when you’re comparing machines. How much input do you want into the process? 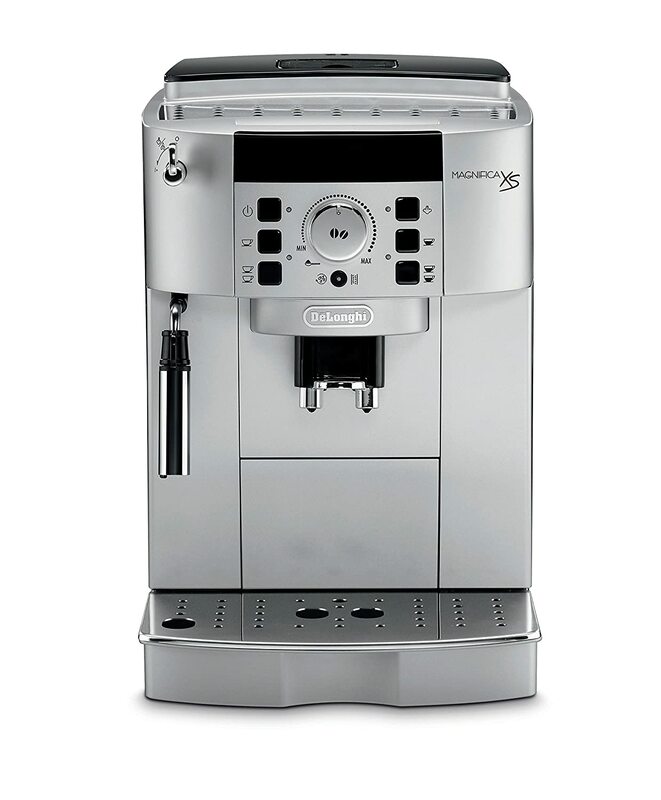 There are 4 main types of espresso machines – manual, semi-automatic, full-automatic, and super-automatic. Manual machines are typically beautiful to look at and will remind you more of the machines at your local coffee shop, but it does mean that the final outcome is largely down to you. You will need to pull the water through your coffee and make sure that you tamp it properly to ensure that the final outcome isn’t too bitter or weak. Super automatic machines don’t’ require any expertise and only minimal input – you just press a button for your coffee. It’s important to be realistic about how much you will really do – sometimes it seems enjoyable to make coffee yourself rather than relying on a machine to take over parts of the process, but in reality that means you may use your machine less because it’s too much time or effort first thing in the morning. Do you want to grind your coffee separately? The grinder is undoubtedly one of the most important tools when making coffee. You need to be able to make your grind as fine or as coarse as you want it – too coarse and you will have a weak shot, too fine and you will over-extract. Many espresso machines include grinders, which means that you don’t need to buy two separate machines. However, if you already have a grinder you’re happy with you may be able to save money by buying a machine without one (assuming you do not want to switch to a super-automatic which will do it all for you). How big is your counter? It’s important to be realistic about size when you’re buying a coffee machine – even the best coffee in the world will still leave you frustrated if you can’t use your kitchen properly. Setting your budget before you start looking at the options is always advisable, especially when the price range of espresso machines goes from around $150 to over $1,500. While the higher end machines do offer more consistent results, better build quality, and more options, you can still buy a machine that makes good coffee in the lower price range. However, you do need to be realistic about what you’ll get for the money. In some cases, a more affordable machine needs a few cheap upgrades to get the most out of it, but will still offer great tasting espressos. Your budget will determine the type of boiler your machine users, which in turn decides whether you can brew and steam at the same time. This generally isn’t too much of an issue but some machines struggle with oilier beans which can cause some frustration. What type of coffee do you want to make? Some espresso machines will only accommodate small cups and will only offer shots of espresso and possibly hot water for Americanos. Others have milk frothers and offer a much larger range of drinks including cappuccinos, lattes, and even mochas. How specific are you about your coffee preferences? Coffee lovers come in many shades, from people who have a favourite bean but don’t necessarily know much about the ins and outs of how espresso works, through to people who have a preferred grind, know how much water pressure they need, and specific water temperature. Your preferences, and how specific they are, will determine how many options you need in your coffee machine and how involved you need to be in the process to be happy with the outcome. How long do you want your machine to last? Some coffee machines can last decades with proper care and maintenance, while others will last a few years. When deciding your budget, it can be helpful to look at the price as a ‘cost per year’ to see what the true cost of the machine is. A $1,500 machine that lasts 10 years is actually more cost efficient than a $200 machine that lasts one year. How patient are you with cleaning and maintenance? Most espresso machines are fairly easy to clean and maintain – they usually have self-rinsing cycles and some will tell when they need maintaining and how. However, some do take more time and effort to keep clean. If you prefer to just throw away some coffee pucks and follow a basic maintenance schedule, it’s important to choose a machine that doesn’t need you to do more. Typically, more automated machines also have more automated cleaning cycles.